Nobility is something that you can afford, if you want. Come and grab it in Marche. You’ve worked all your life to give the best to your beloved and to achieve the highest goals: luxury cars, holidays in the most exclusive destinations in the world and now it’s time to buy a beautiful home in the sun in Italy. If you are looking for that unique mix of historic charm and art, together with an aura of nobility, here is a beautiful noble apartment in Fermo, one of the most attractive and posh towns in Marche. The apartment is located in the very heart of Fermo, just a few steps from Piazza del Popolo and Teatro dell’Aquila, inside a palazzo from the 1700s. The grand staircase with classical marble columns, leads you to the 320 sq.m. apartment, which develops on 2 floors. You’ll be impressed by the fabulous, grand reception room with frescoed ceiling, perfectly preserved. The walls are embellished with delicate curlicues, set in painted frames. The room is adorned with a beautiful white fireplace and precious antique furniture, which give an appearance of class and elegance. The floorings, made of original cotto tiles, give the whole room a warm and welcoming look. As is typical in this kind of homes, from the main reception room, you can access all the other rooms: a twin bed bedroom features a beautiful frescoed ceiling. The spacious master bedroom, features a ceiling with a partly recovered fresco and it is facing south, so you can enjoy a breathtaking view stretching onto the Sibillini Mountains (looking west) and the sea (if you look east). The reception room directly connects also 2 additional bedrooms, very spacious and with beautiful views. On this floor, there’s also a bathroom. Additional bathrooms could be built if necessary. Downstairs there’s the non-noble area, that could be used by the house keeper or may be upgraded to a top class dwelling. It consists of a hall, studio, kitchen, dining room, living room, storage and bathroom. Included in the property, there are also the cellars and grottos, which are excellent to store your selection of wines. They may also be restored to make a SPA or a hobby room, directly connected to the garden. 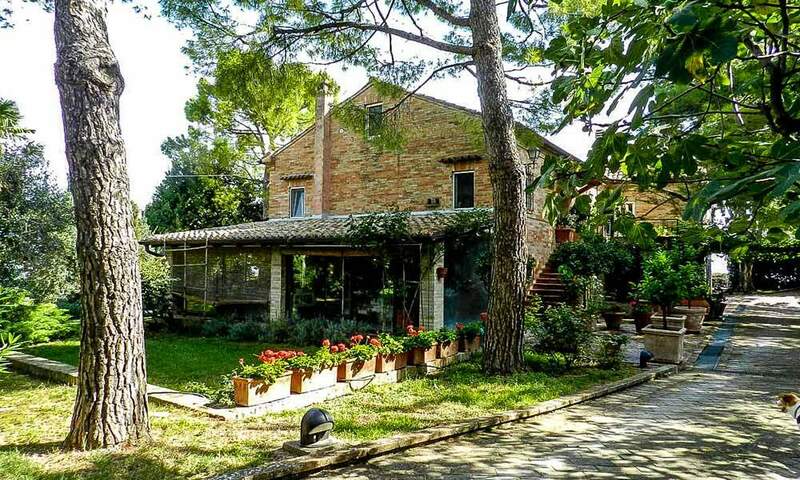 The property enjoys a private Italian garden typical of the 1700s. In spring the roses bloom and you have the feeling of being in a magical place, surrounded by the good smell of flowers and the birds singing. From the garden you can enjoy a beautiful view over the marchigiano countryside, Sibillini mountans and sea. The apartment is located close to the very heart of the town: the magnificent Renaissance Piazza del Popolo, formerly Piazza Grande, where people meet on Sunday mornings for a chat or an aperitif. If you are a lover of history you can not help but own this magnificent home, where you’ll feel like a king in his castle. Thanks to its location, this house is the perfect place to relax in the garden but also to easily enjoy the everyday life of the town. Being in the very heart of Fermo and just 200 mt away from the main square, you can easily have access to all services, meet people and become part of the community. Fermo is a very lively town, with cultural and local events, which are organized all year around.